The following article is an examination and critique of the State governments plan to install a new ticketing system, Myki. The system is based on a debit card that works in the same way as a ticket but contains money. The system has already been trialled in Geelong and has failed miserably. 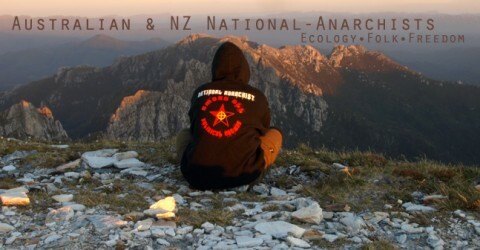 Written by a Ballarat National-Anarchist, from the Ballarat N-A blog. Myki is coming to Ballarat on Monday the 6th of April, with it comes confusion and a lot of people wondering why so much money has been chucked at this unnecessary system. The saying “if it ain’t broke, don’t fix it” will be ringing in the back of many people’s heads. 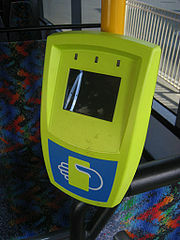 Not only is it useless, it is also more difficult to work than “hand the bus driver change”. Sure, it’s just like scanning an item at the store and we will learn to adapt and get used to it, but that is not the point. A new “swipe card” like system that works on recharging, like prepaid phone credit, it may be easier for some people. However, the government has left the others behind. I have heard MANY elderly people complaining about the system and trying to piece it together. Many have been left asking “what’s the point?”. How many people will we see struggling just to get on a bus? Also, disabled and handicapped people will face a challenge reaching for it and need steady hands for it to register. It seems the neediest are the least cared for. “Float or drown.” Let’s just see how it plays out. ONE POINT THREE BILLION!!!! Are you kidding? Sadly, we are not. Not only is this practically no better than the system already in place, it also cost a HUGE amount and there are still problems with it. Apparently there is nothing else Australia could need with that amount of money than a jazzed up public transport ticket system, will it make life easier? For that price it should serve drinks and tell you the weather for the week. Could this money have gone to homeless shelters? Donations? Bush Fire victims? Red Cross? Orphanage? Zoo? Hospital? Children’s hospital? Pot holes? ANYTHING other than this?! Set the stack of money alight, it will at least keep people warm. Pump it into the economy. Oh and add another $50 to $55 million a year for every year this system is up and running…… A NASA space probe only costs $3 million. A waste? I will leave it to you to decide. – “Has no moving parts to any part of the ticket system, to reduce maintenance costs of future installations.” Hahahaha, yeah, you really care about saving money on this project. Here is a money saver tip – never create such an unneeded system again! – The card can be “recharged” away from the public transport thus eliminating the requirement for cash and reducing queues at vending machines and on buses. The huge lines at the Vending machines and buses? … Everyone still has to get on and swipe, it seems they are trying to grab on to any reason they can find. “You will not longer need to carry money and a ticket.” Ha! There will be even more grand improvements once this actually gets on steady legs. – A big one is the cost, which I have already talked about. You don’t need a scale to see what way this tips. After reading many things, talking to people, hearing conversations on the bus. I deem this a failure, but they had put so much money into it that it would be a bigger waste if they had scrapped it, so it got to a point where they had to bring this out and just try to make it work. The point is, it is a huge waste of time, resources and money. They should think twice about something before they commit to it like they did with this, maybe something more useful. There is no need whatsoever to have this system put in place or have even had the chance to leave the drawing board. Once again, the government failed to meet the real needs of the people and instead wasted money on something no one wants and no one needs. We will get told by advertisements it’s a good thing, so at least some people will believe it is. “Myki is here to stay.